The collision of two black holes, an event detected for the first time ever by the Laser Interferometer Gravitational-Wave Observatory, or LIGO, is seen in this still from a computer simulation. LIGO detected gravitational waves, or ripples in space and time, generated as the black holes merged. For more on black holes see this episode of NOVA aired on PBS. Congratulations to the LIGO team on discovering gravitational waves generated by the collision of two black holes. This discovery provides the first measured evidence of gravitational waves, further validating Einstein's general theory of relativity. Kepco is proud to have provided the ultra quiet, linear JQE Series power supplies which helped make this discovery possible. Kepco is delighted to congratulate Professors Rainer Weiss (Massachusetts Institute of Technology) and Kip Thorne and Barry Barish (California Institute of Technology) on being awarded the 2017 Nobel Prize in Physics for the discovery of ripples in space-time. 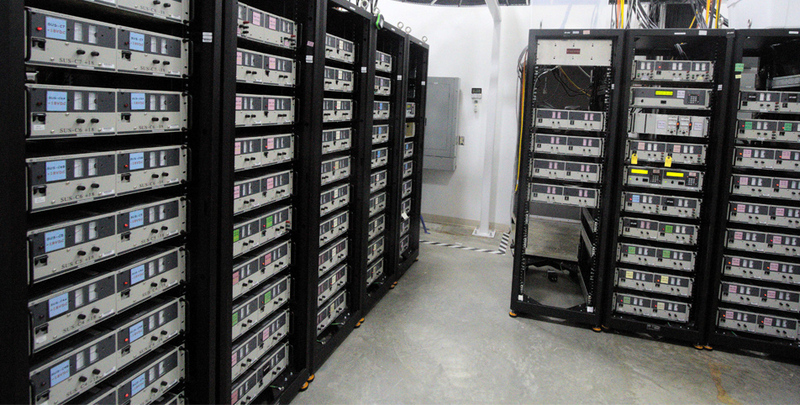 Kepco's JQE 25-20M power supplies were added during LIGO's (Laser Interferometer Gravitational-Wave Observatory) recent upgrade to significantly reduce the RF noise that was interfering with LIGO's measurements. Prior to the upgrade the power supplies in use had noise levels in the 180mV range, whereas the JQE replacements have noise levels of 3mV, a reduction of more than 98%. Kepco is delighted to have played a role in proving Einstein's general theory of relativity. LIGO's discovery has special meaning for Kepco because of Einstein's inspiring role in Kepco's history. Einstein's theories and his role in the creation of the Manhattan Project provided the opportunities that led Kepco's founders, who were physicists on the Manhattan Project at Los Alamos, to create Kepco, Inc. This PhysicsWorld.com blog has more about Kepco's key role in the LIGO confirmation of Einstein's General Theory of Relativity. For an entertaining and informative explanation of what the LIGO discovery means, see this interview of Brian Greene, noted theoretical physicist and string theorist, by Stephen Colbert on the Late Show. LIGO Laboratory operates two detector sites, one near Hanford in eastern Washington (left), and another near Livingston, Louisiana (right).